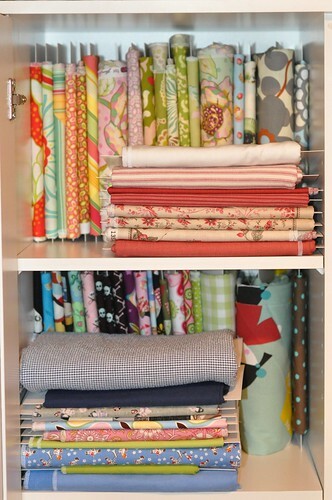 I saw a blog post a few weeks ago with awesome fabric organisation. She had used backing boards for comic books to wind up fabric on for storage. It looked neat and tidy and just what I needed. Unfortunately all the backing boards I could find were sold by people who (like me) wouldn't brave the entity that is the Customs Office and sell internationally. So I had to look up a local stockist. And I managed to find one too. Rickard picked up the boards for me on Monday and I started re-arranging the cupboards immediately. This is how far I've come and I have to say that while it looks good (great, even) it does take up a lot more space than it would if I had folded it neatly and put it in piles. It's a lot more accessible this way though and it's easier to see what I have and what goes with what. Estimating the amount of yardage I have is also easier. I have some ways to go before I can say I'm finished, and I also have lots of fabric that I will pack up and store in the attic. I will modify this idea for that fabric so I can remember what I put in storage.